Schedule your consultation with Dr. Nelson! You may have heard the term “liquid face lift” before. While perhaps a bit of an overstatement, it does have a certain ring to it and represents the use of various injectables to gain broad aesthetic improvement. 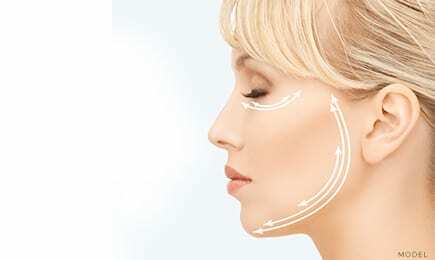 The true liquid face lift entails products that fill in volume to the face or neck, as well as using the muscle weakening agents, such as Botox® Cosmetic, Dysport®, or Xeomin®. Let’s walk through the main types of agents, and how they are used. The most recognized are the injections used to weaken muscle movement and soften wrinkles. These are Botox® Cosmetic, Dysport®, and the new kid on the block, Xeomin®. Botox® has been around for a long time and was used initially to stop facial twitching, spasmed muscles from strokes, tight neck muscles (torticollis), and other medical problems related to overactive muscles. The “Botox® protein” can interfere with muscle contraction to soften the muscles used for facial animation, so we don’t show wrinkles around the eyes, between the brows, on the forehead, or other areas of the face. In fact, it was when Botox® was used in the face for medical purposes that people noticed that facial wrinkles looked better, so the treatments transitioned to also being used for cosmetic purposes. Botox® Cosmetic, the original “Botox®” used cosmetically, actually was approved only for use between the brows (the glabella area) to address the vertical “elevens” lines. When we use these products in other areas, we are using to treat areas outside the original approval. Dysport® and Xeomin® are different variations of the Botox® proteins that do the same thing, partially paralyze muscles. The areas most often used with the muscle weakening agents are between the brows, the outer corners of the eyes (the crows feet), the forehead, the bands in the neck below the chin (the platysma), and the perioral area for heavy vertical lip lines. These injections are extremely easy to do with very little down side when done by an experienced injector. Hyaluronic Acid (H.A.) is a long fancy name, but to keep it simple, it is a natural component of your skin. Skin has collagen, hyaluronic acid, skin cells, fat, and blood vessels as its main components. The H.A. products are Restylane®, Perlane®, Juvéderm®, and Belotero® to name a few; there are always new products being developed, but we will lump them together for this discussion. H.A. products are clear gels that are used to fill volume or add a little substance to where they are injected. H.A. products are commonly used to fill specific wrinkles, for lip augmentation, fill in the folds on the side of your nose to the corner of your mouth (nasolabial folds), or give volume to any spot that could use a little fill. Since hyaluronic acid is a natural part of your skin, it doesn’t require any skin testing and replaces some of the loss of H.A. in your face that occurs from aging and sun damage. These products come in slightly different densities, so the length of time they hang around varies. We use different H.A.’s in different areas depending on the individual product’s characteristics. The products typically last between six months to one year depending on the area injected and the type of H.A. used. The next two products last a bit longer, but serve slightly different purposes than the H.A. products. Radiesse® is an excellent injectable for longer acting filling. It is frequently used for the nasolabial folds, cheek or chin augmentation, or other facial areas that might benefit from a deeper fill. Radiesse® is not an ideal product for the finer superficial lines, which is why we often use different products in different areas of the face. Radiesse® can do an excellent job also for hand filling, especially to help hide large veins of the hands. Radiesse® typically last 12 to 18 months and on occasion up to two years. Another long acting product is Sculptra®. Sculptra® was originally developed as a long term filler to compensate for people with facial fat atrophy. Both Radiesse® and Sculptra® have the advantage that as the body slowly breaks down the injectables, it leaves behind natural collagen, which provides some of the longer acting nature of the products. The H.A. products don’t leave behind significant collagen as they dissolve away like Radiesse® and Sculptra® do. Sculptra® is done as a series of injections of the diluted product. It is used as more of a diffuse filler spread over larger areas of the face. Where the other fillers we have discussed do immediate filling, one nice advantage of Sculptra® is that the body slowly lays down new tissue volume as it breaks down the Sculptra®. This allows you to improve slowly and subtly, so it’s not as noticed by friends and colleagues as you slowly improve over time. Sculptra® can last up to two years which is another nice aspect of the product. 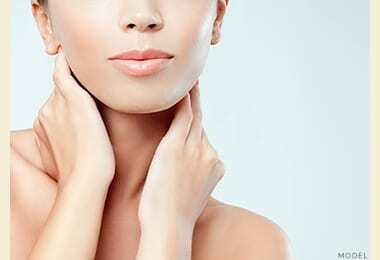 One great area of use for Sculptra® is the décolleté area of the lower neck. This area can become a bit crépey as we age, and Sculptra® does a beautiful job with smoothing out that area and filling in the wrinkles over time. There are new and different fillers coming out all the time, so this is not a complete coverage of the topic, but hopefully it gives you a sense of some of the options for facial and neck filling and wrinkle management.